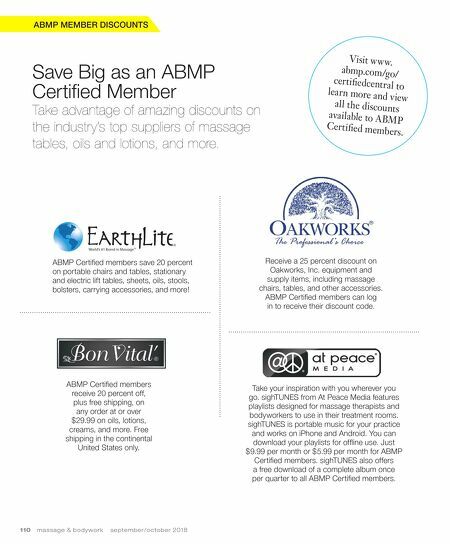 110 m a s s a g e & b o d y w o r k s e p t e m b e r / o c t o b e r 2 0 1 8 ABMP MEMBER DISCOUNTS Save Big as an ABMP Certified Member Take advantage of amazing discounts on the industry's top suppliers of massage tables, oils and lotions, and more. Visit www. 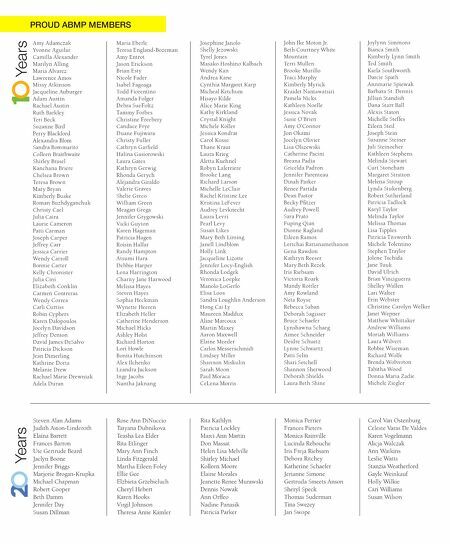 abmp.com/go/ certifiedcentral to learn more and view all the discounts available to ABMP Certified members. ABMP Certified members save 20 percent on portable chairs and tables, stationary and electric lift tables, sheets, oils, stools, bolsters, carrying accessories, and more! Take your inspiration with you wherever you go. sighTUNES from At Peace Media features playlists designed for massage therapists and bodyworkers to use in their treatment rooms. sighTUNES is portable music for your practice and works on iPhone and Android. You can download your playlists for offline use. Just $9.99 per month or $5.99 per month for ABMP Certified members. sighTUNES also offers a free download of a complete album once per quarter to all ABMP Certified members. ABMP Certified members receive 20 percent off, plus free shipping, on any order at or over $29.99 on oils, lotions, creams, and more. Free shipping in the continental United States only. Receive a 25 percent discount on Oakworks, Inc. equipment and supply items, including massage chairs, tables, and other accessories. ABMP Certified members can log in to receive their discount code.